You must be a member of the Lisbon DinnerNations Group to attend this activity. Would you like to join this group? We hope the start of Protected content treating you well! You are cordially invited to join us for another dinner in Lisbon! Let's get together for some more delicious food, great conversation and an opportunity to make some new friends, or, chat to old ones! 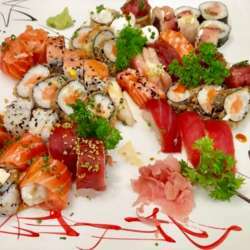 We have chosen this restaurant for its' delicious Japanese food; great reviews; style, and location in Campolide. REMEMBER, if you signed up but are unable to attend, please decline the invitation, so that others can join, and we give the restaurant the correct numbers and don’t have to pay for no-shows! Crepe de legumes; trouxinha frango; pastel japonês e sopa miso. Rodízio de sushi e sashimi, sem limitação de quantidades. 2 bebidas por pessoa [desde águas, refrigerantes, chás, imperial; cerveja s/álcool e vinho branco ou tinto (1⁄2 garrafa por pessoa)]. Mousse chocolate; mousse manga; gelado sésamo ou gelado chá́ verde. Attendees pay their €28.50 directly to the restaurant on the night. However, if you sign up for this special-priced menu but don't show, the restaurant would be entitled to ask for your payment! Please note that an invoice for your meal can be issued by the restaurant on the night of the event. "Living the InterNations spirit - Nobody stands alone!" InterNations is constantly growing and for many guests, this will be their first event. Please be welcoming and introduce them to your friends. Live the spirit of connecting global minds to ensure that every member has a lovely time!